When sorting the 164 qualified relief pitchers by fWAR the household name relievers are there —— Edwin Diaz, Sean Doolittle, Aroldis Chapman, Felipe Vazquez. However, sitting just below them at tenth in fWAR (1.4) is 24 year-old Texas Ranger, Jose Leclerc. Leclerc is in his second full season in the bigs, meaning he has one more season of pre-arb salary followed by three years of arbitration. In simpler terms, he has four and a half seasons of team control remaining. He’s currently making $552,300 — just a pinch more than the MLB minimum salary of $545,000. This is important but I’ll touch more on why later. 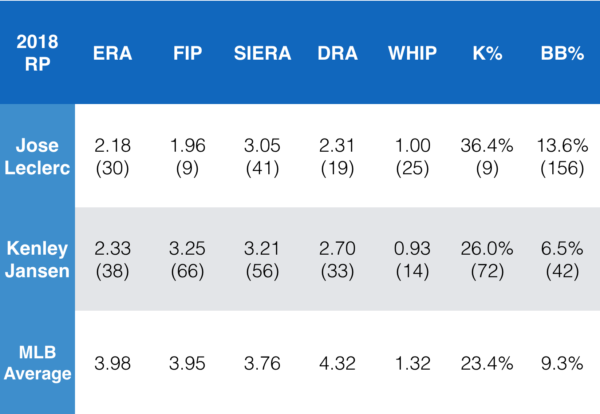 Here’s how Leclerc has performed compared to the average relief pitcher, and to the best Dodgers reliever, Kenley Jansen. Leclerc is mainly a two-pitch guy, pairing the fastball with an impressive off-speed offering. He averages 95.2 MPH with his fastball which on the Dodgers would trail only Pedro Baez (96.4) and Daniel Hudson (95.8). He throws his main off-speed pitch just as frequently as his fastball around 45% usage on both depending on the source you use. The pitch classification is interesting as it differs from site to site, pitch to pitch. Sometimes it looks more like a cut-change, sometimes it looks like a slider with slight glove side run and strong drop, and sometimes it looks like a splitter with vertical drop and almost no run. FanGraphs calls it a change-up, Brooks Baseball calls it a splitter, and Baseball Savant calls it a slider. Maybe it’s just classification being incongruent, maybe there are errors, it’s tough to really know. Regardless, the pitch is extremely effective. 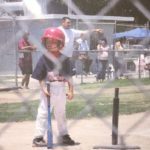 This article does a great job going deeper into the pitch itself. Of all offspeed offerings, Leclerc has allowed the ninth lowest batting average (.119), and the fifth lowest slugging percentage (.136) and wOBA (.139) in the league. That’ll get the job done. Of 164 relievers who have thrown at least 100 “sliders” Leclerc generates a 23.9% whiff rate ranking 19th. It’s definitely a good pitch and it’s working well for him. He could potentially benefit from some work with Rick Honeycutt and Mark Prior as the only thing really holding him back is his 13.6% walk rate. He’s allowed only 15 hits in 33 innings while walking 18 so he’s still his own worst enemy. That makes him one of only three qualified relievers (Kyle Barraclough and Reyes Moronta) to walk more batters than hits allowed, which is an impressive stat by itself. Typically this is a bad list to be on, however I’d argue that on occasion it’s indicative of a tough pitcher to hit who has a legitimate shot at becoming a lights-out reliever. When he isn’t walking batters it’s pretty much game over. His strikeout rate of 36.4% is ninth —— sandwiched between Craig Kimbrel and new Cleveland reliever Brad Hand. That’s good company to be in. He’s allowed an astonishingly low .133 batting average which is the fourth-lowest in the league, paired with the second-lowest slugging percentage (.193). Essentially meaning that batters facing Leclerc this year have hit like Jon Lester (.125/.125/.200). Leclerc is just 24 and in just his second full season, so it’s probably fair to say he’s just a guy with good stuff hitting a stride. Just last year he had a 3.94 ERA and a 4.49 FIP over 45 innings while walking an incredible 20% of batters he faced. That was the highest single-season mark of any reliever with at least 40 IP since 2004. So last year he wasn’t great, yet he still allowed only a .146 batting average which was sixth among 192 RP with 40+ IP. Another part of his game staying congruent both seasons was his ability to generate weak contact. Last year of 213 relievers with at least 100 balls in play, Leclerc allowed an average exit velocity of just 84.5 MPH ranking 30th. This year that average exit velocity is down to 81.2 MPH, which is the lowest in the league. That talent is also evident as he’s one of only six qualified relievers to not allow a single home run this year. While he’s not Chapman or Dellin Betances, he shares similarities with them in high strikeout rates, filthy stuff, and issues allowing walks early in his career. He’s been great and still has plenty of room to improve. It’s tough to gauge the market for a guy like Leclerc but I’ll throw together a potential package. Rios and Peters were ranked No. 11 and 12 in Dustin’s latest midseason Top 30, while Copping was unranked (but he was ranked at No. 61 in the Top 100). It’s a steep price that is mainly warranted by Leclerc’s youth and team control. 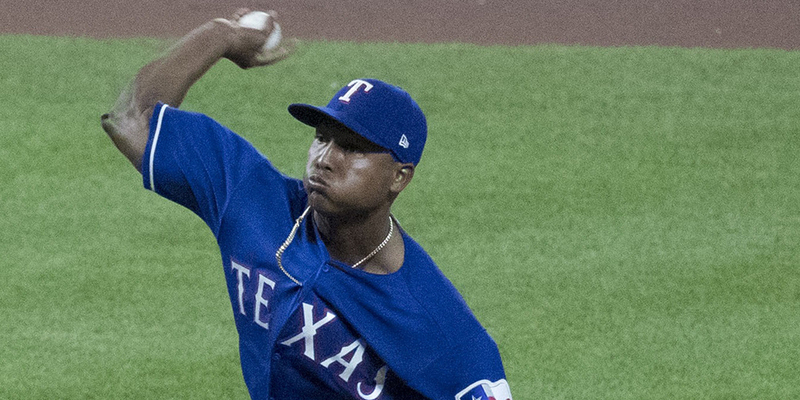 It’ll also depend much more on what the Rangers would want, but after the Brad Hand and Francisco Mejia deal it’ll be interesting to see how the market for relievers is priced. Keone Kela, Alex Claudio, Jake Diekman, and Tony Barnette from the Rangers all also intrigue in some way or another as possible upgrades in the Dodgers bullpen if the Dodgers liked any of them enough. The Dodgers are now dangerously close to the luxury tax. It’s more important now than it’ll be in the future, but Leclerc is as cheap as they come contractually. If he can maintain this form or even improve going forward that’s an incredibly valuable piece controlled for years to come. I will say that taking a flyer on a guy like Leclerc who looks to possess strong upside but may need some time to get there is a legitimate risk. It probably made more sense before the Dodgers traded for Manny Machado as the team now has less prospect capital and less financial room to acquire a setup man. I’d argue that prioritizes a proven reliever over a guy like Leclerc. At the same time, with the Dodgers so close to the luxury tax there or only so many options for guys near the minimum salary, and proven guys are hardly ever on minimum deals. Leclerc is a good one.